Barton Veterinary Centre is an Accredited Practice. Pets are treated as members of the family and owners rightly want to be sure they receive excellent medical treatment. The regulatory function of the RCVS (Royal College of Veterinary Surgeons) has always meant that users of veterinary services could be assured that their veterinary surgeon was properly qualified and fit to practise. Now, for the first time, the RCVS can offer reassurance that those practice premises which it accredits as part of the Practice Standards Scheme also meet stringent standards. It offers peace of mind to clients of accredited practices and more informed choice to the animal-owning public. To become accredited, practices volunteer for rigorous inspection every four years and will have met a range of minimum standards including hygiene, 24-hour emergency cover, staff training, certain types of equipment and cost estimation procedures. They may also be subject to spot-checks between inspections. 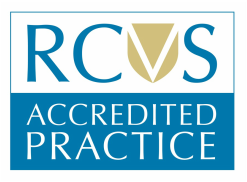 For peace of mind, people should look for the RCVS accredited practice logo, which indicates that the practice has passed an independent inspection. This means high standards of care for pets and peace of mind for pet owners. Meet legal and health and safety requirements covering its premises, equipment, clients and employees. Click here to find out more about the RCVS Practice Standards Scheme.